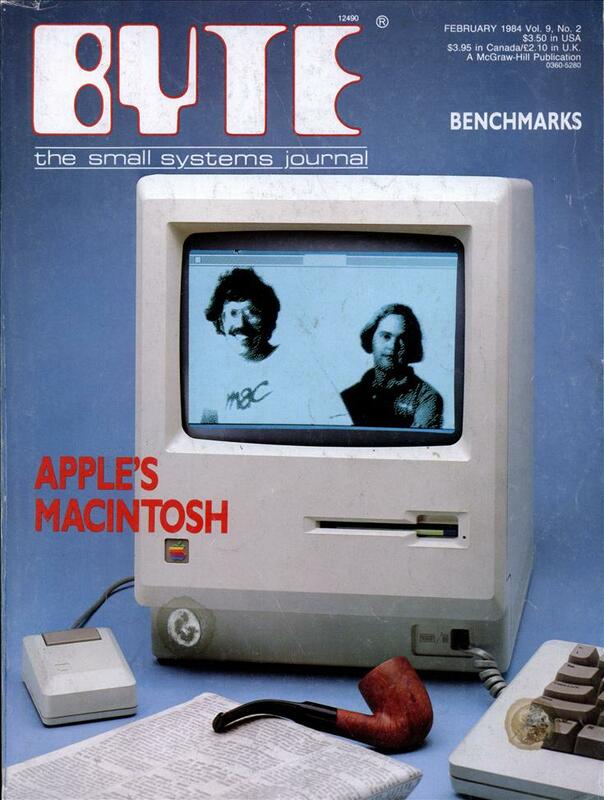 When several of us at BYTE saw the Macintosh, we were seriously concerned about the fate of the Lisa in the face of the Macintosh, a machine that is one-third its price and clearly superior in some areas. Apple has answered these concerns by announcing two versions of the Lisa 2, along with the Macintosh, at its annual stockholders’ meeting on January 24. The Lisa 2 will use the same modified Sony 3-1/2-inch floppy-disk drives as the Macintosh. It will be sold with a new, faster operating system, one 3V2-inch floppy disk, and 512K bytes of memory (the single drive takes the place of the two 5-1/4-inch drives in the Lisa 1). The Lisa 2 includes a mouse, detached keyboard, built-in 12-inch video display, and can be expanded to 1 megabyte (the memory capacity of the Lisa 1); it will cost “under $4000,” according to Apple (the exact price had not been decided when this was written). The Lisa 2/10 will add an internal 10-megabyte Winchester hard disk and will sell for “under $5500.” All the Lisa application programs will be available separately for $200 to $400 each. 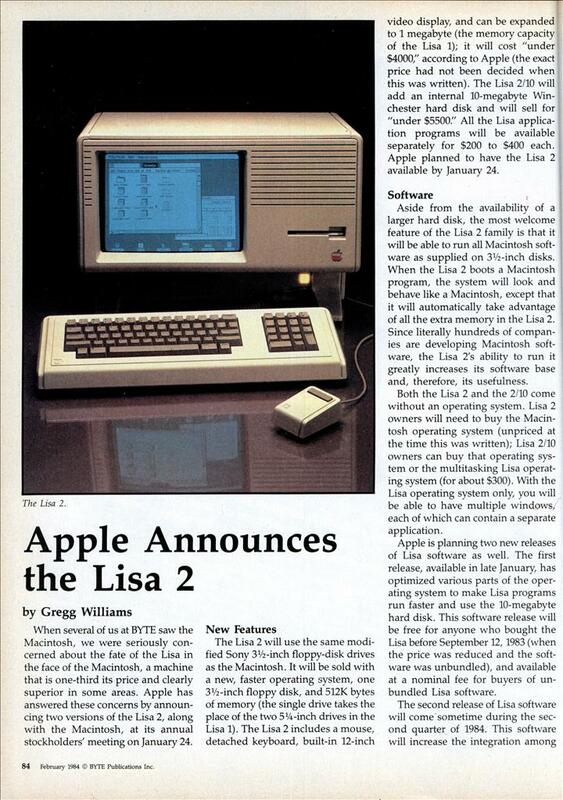 Apple planned to have the Lisa 2 available by January 24. Aside from the availability of a larger hard disk, the most welcome feature of the Lisa 2 family is that it will be able to run all Macintosh software as supplied on 3-1/2-inch disks. When the Lisa 2 boots a Macintosh program, the system will look and behave like a Macintosh, except that it will automatically take advantage of all the extra memory in the Lisa 2. Since literally hundreds of companies are developing Macintosh software, the Lisa 2’s ability to run it greatly increases its software base and, therefore, its usefulness. Both the Lisa 2 and the 2/10 come without an operating system. Lisa 2 owners will need to buy the Macintosh operating system (unpriced at the time this was written); Lisa 2/10 owners can buy that operating system or the multitasking Lisa operating system (for about $300). With the Lisa operating system only, you will be able to have multiple windows, each of which can contain a separate application. Apple is planning two new releases of Lisa software as well. The first release, available in late January, has optimized various parts of the operating system to make Lisa programs run faster and use the 10-megabyte hard disk. This software release will be free for anyone who bought the Lisa before September 12,1983 (when the price was reduced and the software was unbundled), and available at a nominal fee for buyers of unbundled Lisa software. The second release of Lisa software will come sometime during the second quarter of 1984. This software will increase the integration among Lisa products (for the first time, you will be able to move graphics from Lisa Draw to a text document in Lisa Write, data from Lisa Calc to Lisa List, and data from Lisa Terminal to Lisa Calc, for example). It will also include enhancements in many of the Lisa application programs. For example, Lisa Write will include a spelling checker and the ability to process form letters, Lisa Graph will allow data to be graphed in new ways, all programs will support a $5000 laser printer and a 70-megabyte hard disk to be introduced by Apple, and Lisa Draw and Lisa Graph will support color printing. The second release of Lisa software will be available to owners of previous versions for a nominal fee. Lisa 1 owners have two upgrading paths. Apple will let them upgrade to a Lisa 2 for free or to a Lisa 2/10 for $2500 (both upgrades involve replacing parts in the Lisa 1, not swapping the Lisa 1 for a new Lisa 2). In both cases, Lisa 1 owners will keep their 5-megabyte Profiles, thus allowing them to transfer all their information to the new system (by copying all such data from 5%-inch floppy disks to the Profile before converting to the Lisa 2). With the announcement of the Lisa 2 and 2/10, Apple has made the Lisa computer both more competitive and part of an innovative, powerful, but still affordable family of computers. The reduced price and Macintosh software compatibility of the Lisa 2 make it far more attractive to potential buyers than the Lisa 1 was. The features added to the Lisa application programs make them even more useful than they currently are. Finally, Apple’s upgrading policy is commendable because it does not leave behind the Lisa 1 owners who supported the machine in its early days. The LISA was so bad they came out with LISA 2! I do remember thinking WOW a five meg hard drive.